It's coming up to 6.30 am and I'm ravenous! 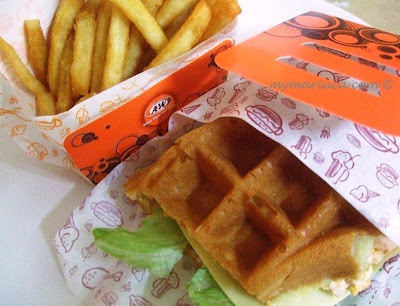 Have you tried the new egg waffle from A&W yet? I was a little apprehensive at first for I usually enjoy my waffles sweet; with butter or honey but a savoury waffle sounds interesting as well. I also love Paddington Pancakes and those are savoury in flavour so as usual, I was enticed and simply had to taste the new egg waffle! My first bite was small and cautious. As curious as I was; I was somewhat afraid the egg waffle would taste horrible. I am pleased to say however that my fears were unfounded and the egg waffle is actually quite tasty! I love that it is not over loaded with stuffing or vegetable. The egg filling on its own is yummy with pieces of what seems to be bacon crisps. Topped with a slice of cheese, the egg waffle is delightfully yummy! Chicken waffle is also on the menu by the way but I'm not that adventurous yet. The set comes with fries and makes a great breakfast or lunch meal. Bon Appétit! yihaa!!!... i so wanted to try this egg waffle too GP but was afraid that it might taste weird.. but now that you sampled it and approve.. i might just try it next time!! thanks for review dearie... and nite nite!! handing over keys to landlord tomorrow.. so sad.. me and A was saying goodbye to all the rooms just now. lol!! 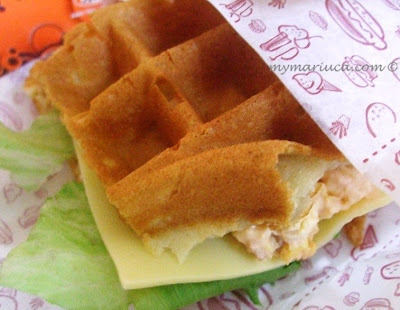 i hvn't tried the new egg waffle from A&W yet! Recent blog post: Who wants to win a Louis Vuitton Neverfull Bag? U haven tried Mon? I think u will like it, B is not confident to taste it tho he he! i think i will like it too! hehe why lah B is not confident to taste it? LOL now 9 points edi ho ho! Oooops I forgot! Shhhhhhhh hehehehhe…. LOL!!! I think chicken waffle lagi taste weird! hahahhahha! waffle tu nampak sedap.. eh ...ekat waffle tuu ada sayur kobis yer? That’s why I’m not adventurous to try chic waffle yet Mon lol! i'd love to have some please. i haven't taken my breakie and my stomach is rumbling like crazy. Morning Debbs! Me too hungry! Feel like some eggs yum! I like waffles but never tried them with eggs. I usually have them with honey and cinnamon. A&W is not really famous here in the Philippines, and not sure if they are serving it here also. But would love to try one when I pass one by. looks yummy! In fact I've stolen 2 of those root beer mugs ... LOL! Long long time didn't go A&W oredy! Egg waffle? that's new! Recent blog post: Can You Spend A Whole Day At Shopping Malls?